Camping Cala Ginepro offers the opportunity to spend your holiday in Sardinia next to the wonderful Bidderosa Nature Reserve. 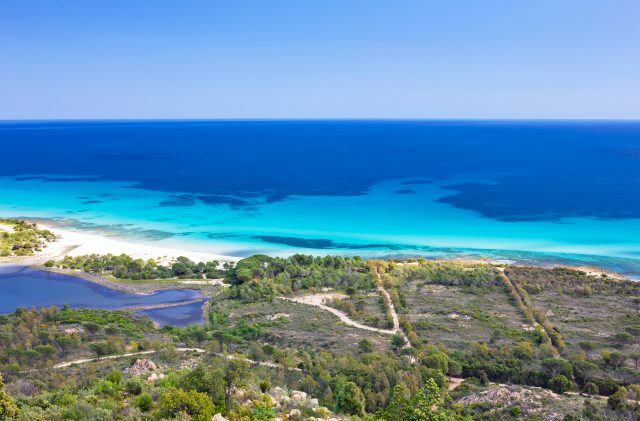 The “Oasis of Biderosa” - or Oasis of Bidderosa - comprises 5 dream-like beaches, set within a site extending across more than 850 hectares, which is protected by the Sardinian Forestry Commission. Bidderosa is an exceptionally valuable and beautiful nature reserve, and should be a must-visit at least once during your Sardinian break. It can be reached from the campsite in various ways: by sea, over land or via the beach. On the fully equipped Cala Ginepro beach, next to the campsite’s bar, you can hire kayaks to reach Biderosa. During summer, our entertainment team here at Camping Cala Ginepro often organises excursions by canoe to visit this breathtaking nature reserve. Enchanting Biderosa can be reached from Cala Ginepro beach by walking along the shore and by crossing an outlet – this latter step can, though, be rather challenging. Heading northwards, leaving the Cala Ginepro reef behind you, you reach Sa Curcurica beach. Continuing towards the small slope, you reach the outlet of the Sa Curcurica basin. The outlet can be crossed at the far left, but you need to take great care and be very cautious, because the ground in this tract can be slippery. The outlet can also be crossed at the part closest to the sea – but only in the absence of currents, again taking great care and selecting the lowest point, because depending on the tide the water level can reach 1.5 metres and the currents can be very strong. As such, we recommend taking this option only if the following 3 conditions are met: 1) the sea is calm; 2) there are no currents 3) you are expert swimmer. It is essential to proceed with caution, bearing in mind that the Biderosa Nature Reserve can be reached by car or bike in just a few minutes from the main road. Reaching Bidderosa by car or motorbike is the most popular method amongst those holidaying in Sardinia! It is convenient and easy, and in next-to-no-time you will find yourself immersed in a setting of quite incomparable beauty not far from Orosei. The entrance to the Biderosa Oasis is also easy to reach by mountain bike. MTBs for men, women and children can be hired from Reception at Camping Cala Ginepro. From the campsite exit, take Viale Cala Ginepro until you reach the junction and then turn right, heading northwards on the SS 125 “Orientale Sarda” (Eastern Sardinia) road. At the point marked as “Km 236,5”, you will see signposted the entrance to the Bidderosa Nature Reserve (“Oasi di Bidderosa”), where you can buy your tickets. The paths for the Biderosa beaches can be taken by car or motorbike, or on foot if you like trekking, or in the saddle of a mountain bike. The Biderosa Nature Reserve allows only limited numbers of cars and motorbikes to be inside at any one time; entry on foot or bike is not subject to limitations – better still, the tickets cost less that way. Once you are inside the Oasis of Bidderosa, you can ascend Mount Urcatu, which affords an utterly awe-inspiring view. From Bidderosa, the climb up Mount Urcatu takes some effort and leads at the summit to the trig point, with a spectacular vista across the Gulf of Orosei. On reaching the peak, the canopy and the wooden benches offer some shaded relief. Surrounded by astonishingly clear water and the perfumes of the Mediterranean maquis, from Monte Urcatu you can catch glimpses of Camping Cala Ginepro on your right.